Instant Downloads and Gift Certificates are available ANY time. This listing is for one (1) Gift Certificate to my shop AroundTheHomeDecor.Etsy.com in the amount of $20 USD. It can be redeemed for any items found only in my shop and can be applied toward shipping on the order when making a purchase using the gift certificate. Perfect for those who wish to give the gift of choice or need a last minute gift idea! This is a Digital Download to provide the fasted delivery of your Gift Certificate as possible! No physical item will be mailed. The Digital Download will be automatically sent to the email account associated with your Etsy account upon purchase. Forward the email containing the Gift Certificate and redemption instructions to to the intended recipients email address. Redemption Instructions will be provided, including how to use the Unique Code during checkout. IMPORTANT: Please provide me with the recipients first and last name in the NOTE TO SELLER during checkout, as it will be required for redemption of the gift certificate. If you do not wish to use this method, please contact me after purchase for a different type Unique Code, which you will need to provide to the recipient separately. or any custom amounts (message me for details). *Gift Certificates are NON REFUNDABLE and hold NO CASH VALUE. *Gift Certificate does not expire, but is best to use within 12 months to ensure availability. *Gift Certificates will be emailed to the buyer once purchased. You will receive 2 documents including, 1 Printer Friendly Gift Certificate and 1 Redemption Instructions Sheet. *Any outstanding balance on the certificate may be used toward future purchases. *Any amount due over the value of the gift certificate will need to be paid following the instructions in the redemption document before order is processed. *Gift Certificates require the recipients first and last name to be redeemed. Please provide this information to me during checkout in the NOTE TO SELLER box. 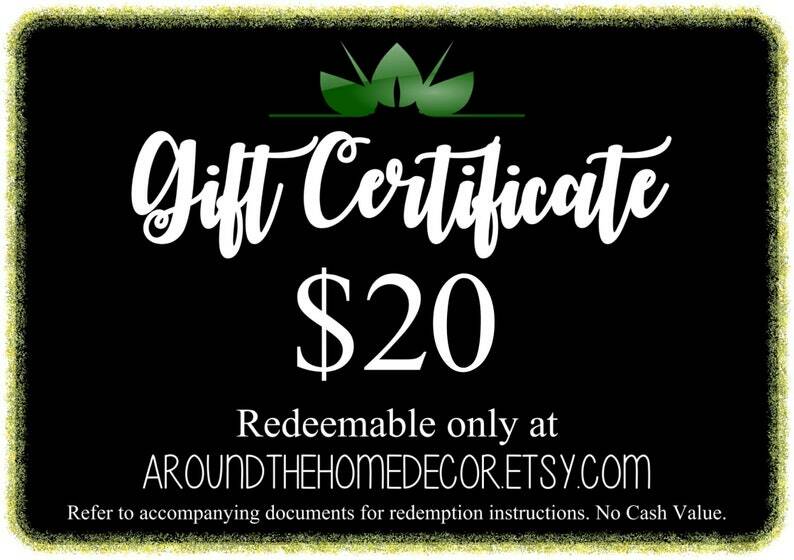 Thank you and enjoy your shopping with us at Around The Home Decor! I purchased this for my son's Easter basket. He hasn't received it yet, but it looks exactly as I expected, and it smells great! He gets a little jealous of his sister's awesome bath bombs so I was excited to find one that he would LOVE! PokeBomb - Bath Bomb with Surprise Pokemon Figure Toy Inside. Ready to ship! can't wait to try this on the honeymoon! I will gladly create a custom or personalized item for you! This is something I specialize in. From custom colors, fragrances and designs to personalized labels and tags to give your item that memorable touch, I can help! Please note that custom orders are nonrefundable for any reason other than a material defect. Exact shades of colors can not be guaranteed. If you are requesting that your items be made in a specific color, it is STRONGLY recommended that you message me a color swatch or an example of the color you need for reference. I carry a large variety of items, please see each item for sizing information. If you have further questions, do not hesitate to ask. If you are ordering a product from me and have any questions about best practices in use or storage to get the most out of your item, please ask. We do offer Gift Wrapping. Gift Wrapping varies depending on the item/s being wrapped. You can choose gift wrapping during checkout for an additional $4. Yes, we do accept wholesale orders on many of our items! We make every single item in our shop by hand and do our best to keep our prices low. Because of this our wholesale availability varies on a case by case bases. If you are interested in buying our products wholesale, please message us and we will be happy to work with you and find a solution that fits both of our needs. Returns, Exchanges & info for EU Buyers. Due to the nature of our items, and the fact that each item we make is custom made to order for the buyer, we do not accept returns or exchanges. But don't worry! Your purchase is still guaranteed to be free of any material defects. If you find that your item has arrived damaged or there is a problem with performance, please let us know right away and we will work with you to make the situation right. Your satisfaction is very important to us! Please contact our shop with any issues. Please DO NOT send any packages back to us without prior approval. Any items returned to the store without prior approval will be ineligible for a refund or compensation. Certain orders placed by EU buyers are eligible for return within 14 days of delivery.